74 acres consisting of a large portion of the Bayshore Peninsula on the western shore of Oakland Bay, Puget Sound. Located three miles northwest of Shelton in Mason County, Washington on Oakland Bay. The property features 27 acres of pristine salt marsh habitat, over 4,000 feet of Oakland Bay shoreline, and the lower portion of Johns Creek. 47 acres of the property are a former golf course that are being restored to native habitat. Part of the completed restoration includes removal of buildings and a 1,400 foot tidal dike, and the creation of new tidal channels along the marine shoreline and new side channels on Johns Creek. Capitol Land Trust permanently returned 250 acre-feet/year of surface water rights, previously used to irrigate the golf course, to instream flow for the benefit of salmon and other wildlife, through the Washington State Trust Water Rights program. The Bayshore Peninsula is an important cultural location for the Squaxin Island Tribe, who were one of the only Salish tribes in Puget Sound to not depend on a river system. It is thought that the Bayshore Peninsula once hosted the largest longhouse in south Puget Sound. The property contains very large Douglas-fir trees and both old and young Oregon white oak trees. The marine and freshwater ecosystems of Bayshore Preserve provide important habitat for several species of salmon, marine mammals, and a multitude of waterfowl and bird species. While trail improvements have yet to be made on this 74-acre property, visitors are welcome to come and enjoy views of Johns Creek and Oakland Bay while witnessing Bayshore Preserve’s transformation from golf course to nature preserve. Long-term plans for the preserve include an ADA accessible trail, viewing platforms, and covered structures to support environmental education programming already taking place here. In March, the land trust celebrated the purchase of the former Bayshore Golf Course and adjacent saltmarsh on Oakland Bay near Shelton. It was both the culmination of a thirteen-year effort to protect an important natural asset, and the beginning of ongoing stewardship on the newly named Bayshore Preserve. The stewardship will include: assisting the recovery of a natural area that has been damaged; enhancing the conifer and oak woodlands, Johns Creek, and saltmarsh; and improving the preserve’s ability to nurture wildlife, including chum, coho, and Chinook salmon. The area has gone through many changes in the last 150 years. Five generations of one family owned the property during most of that time and opened a golf course in the early 1930s. Enoch Willey operated a sawmill beginning about 1870 near the mouth of Johns Creek—originally the site of one of the Squaxin Island Tribe’s largest longhouses and villages. The golf course was sold in the 1950s, but with the recession of 2008, revenue and use of the golf course declined. The owners realized they would need to sell, which is when the land trust stepped in. The bulk of planned restoration activities for Bayshore Preserve are funded with grants from state and federal agencies, contributions from the Squaxin Island Tribe and Taylor Shellfish Farms, and donated professional services from Mason Conservation District. Demolition of the buildings was the first part of the restoration process. Another key repair will be the removal of a 1,400-foot dike that holds tidewater back from the old golf course fairways. This, along with grading, sloping, and excavating blocked channels, will allow future tidal flow over an additional ten acres—and the saltmarsh—as sea levels rise. The return to a more natural state is fostered by retiring the use Bayshore Preserve of Johns Creek water for irrigation of the golf course fairways. As a result, stream flow into the bay will increase, and the land along Johns Creek will recover—naturally and with our help as we remove invasive plants and plant native species. The former golf course acreage also will be planted with native trees and shrubs. A unique feature of the land is the presence of mature, native Oregon white oak trees along with soils conducive to an oak woodland environment (uncommon in this area) that can provide habitat for the endangered Taylor’s Checkerspot butterfly. 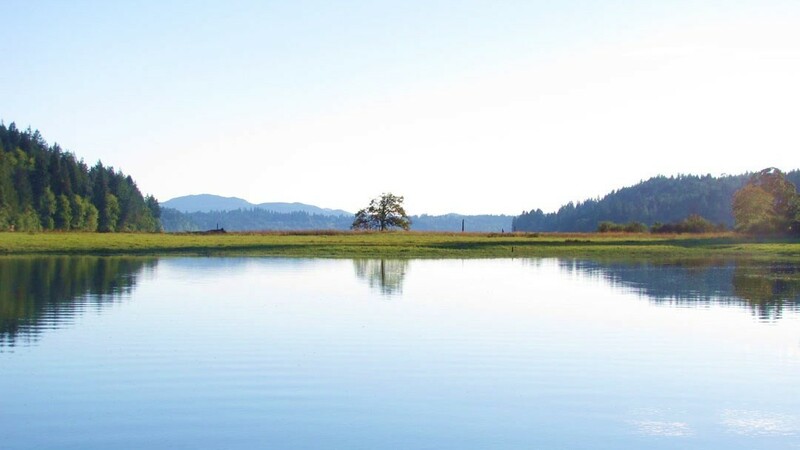 On the preserve’s north border is a Washington Department of Fish and Wildlife (WDFW) water access site, which draws people to harvest shellfish and fish in the bay. Capitol Land Trust is working with WDFW to help ensure that existing and recovering tidal marshes are not damaged by foot traffic. To that end, trails and signage have been enhanced. In coming years, nature and humans will collaboratively help the preserve’s ecology heal and evolve in ways that are sometimes predictable, sometimes not. Our stewardship includes annual inspections by staff and volunteers to monitor progress and recommend further actions.